The dynamics tab is responsible for specialized dynamics that require the user to click on the corresponding note or note range. Normally enter a dynamic that is not aligned. Dynamics will be entered on all staves. This is very useful if you are composing an orchestra. Dynamics will be entered on the brace or bracket in which you enter the dynamic. This is useful if you wish to have certain dynamics based off of certain instrument groupings. If you are composing for a two staved instrument such as the piano, harpsichord, celesta, etc, dynamics will be entered in the center of the two staves. You may align and/or expand a symbol already on the score. An example will help you understand what Symbol Alignment is meant to achieve. Let’s say you wish the forte symbol (f) to repeat on all staves, or just on staves that have a brace or bracket. This function easily allows you to achieve this. Piano symbols are unique in that they normally are displayed in the center of the two staves. 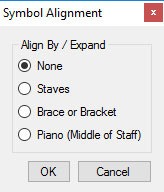 Music Jotter will automatically center the forte symbol if a symbol is aligned by a piano staff.